I am often amazed at the incompetence of people claiming to be Ceremonial Magicians. 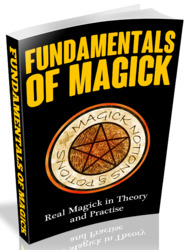 Many of those whom I have met seem to think that the LBRP is the highest level of Ritual Magick, then wonder why Pagans criticize them for their "complicated rituals." In fact, some self-described magicians drop the "Lesser" so that the LBRP becomes THE Banishing Ritual of the Pentagram. This is totally wrong and totally in error. 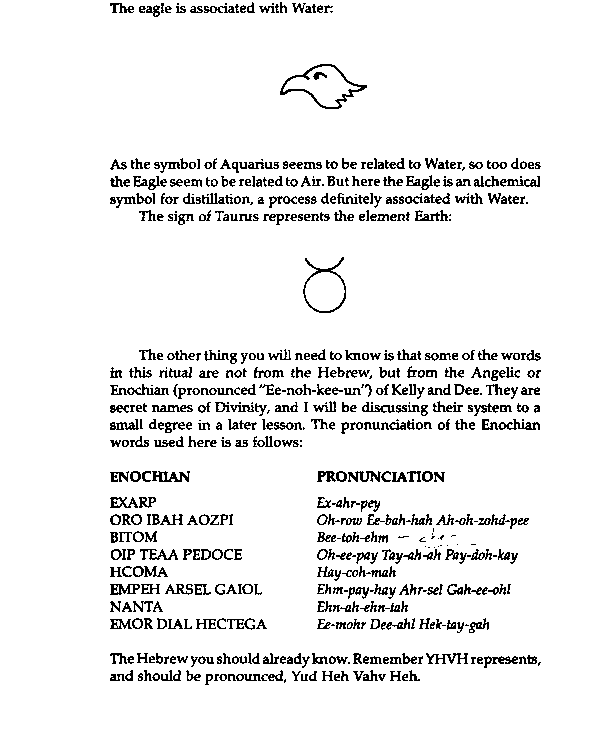 The LBRP was given to the members of the Golden Dawn (remember, they were a non-magjckal group) to prepare them for the magickal work to come in the Inner Order of that organization. It is hoped that you have been practicing the LBRP for many months. Time will not wait, and it is important that you are fully competent with the LBRP so that you can start practicing this, the Supreme Invoking Ritual of the Pentagram. 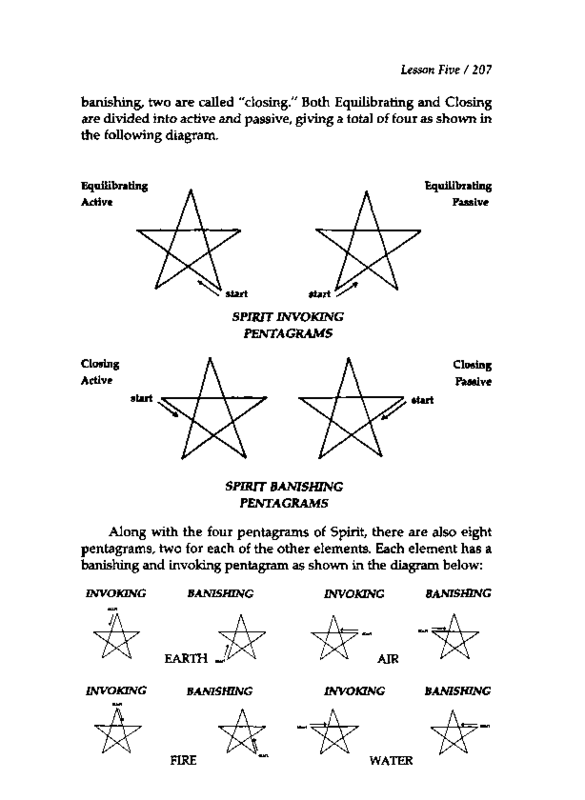 As you probably remember, the points of the pentagram represent the five magickal elements: Spirit at the top, then, going counterclockwise, Air, Earth, Fire and Water (see diagram). In the LBRP you will note that since we start from the lower left we are moving away from the center of elemental Earth. Had we moved from the top toward the lower left corner when making the first line we would be performing the Lesser Invoking Ritual of the Pentagram. Some people advise doing the invoking in the morning and the banishing in the evening. I believe this to be a dangerous practice. The banishing must be learned and effective first. Being able to do the LBRP effectively is a prerequisite for the rest of this course. 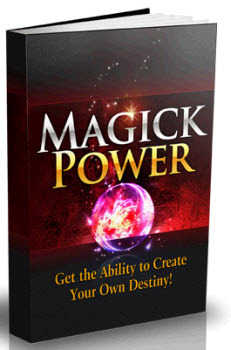 The Supreme Invoking Ritual of the Pentagram is a more powerful version of the Lesser Invoking Ritual of the Pentagram. As you can guess, it can become the Supreme Banishing Ritual of the Pentagram by using the banishing forms of the pentagrams instead of the invoking ones. However, the purpose of this ritual at this time in our work is to bring into our lives all of the forces of the elements. Later, it will take on even more importance. At this time, practice this ritual only in the morning. When doing this work, at this time in the course, always follow it with the LBRP. 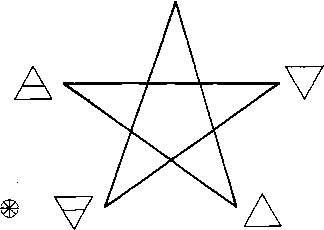 Do not perform the Supreme Invoking Ritual of the Pentagram (SIRP) in the evening. This is not because the SIRP is dangerous, but because it can be very invigorating and might cause you difficulty in falling asleep. This is especially true when you are in the learning process and have not perfected the ritual. Why use the lesser banishing ritual of the pentagram? Can do the lesser invoking in the evening?